In 1993, science-fiction author Poul Anderson published Harvest of Stars, the first in a four-volume future history that depicted the human race grappling with machine intelligences. That first volume was mainly a libertarian fantasy about independent spacers evading a tyrannical world government, but it ended with a colony to Alpha Centauri launched just as true AI was appearing on Earth.For Anderson, superhuman intelligences were scary because they might lead to a managed economy, the great bugbear of libertarians like himself. But also, Anderson started off writing science-fiction in the 1950s when everyone envisaged intrepid space cowboys flying their ships all over the galaxy. By his old age, it was becoming evident that automation meant humans would have little direct role in piloting craft or working any other machines. Furthermore, other forward-thinking authors like Vernor Vinge were suggesting that humanity might even choose to simply stay put and move into a virtual reality instead of expanding outward into the galaxy. 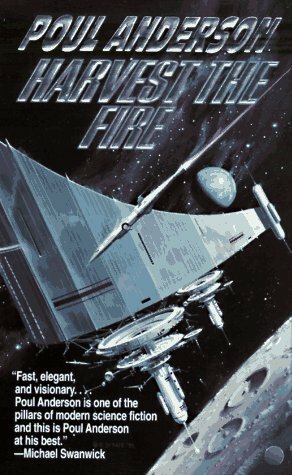 This reversal of all he had held dear left Anderson appalled.Harvest the Fire, published in 1997, is the third book in this series, its title being a portmanteau of that of the first book and the immediately preceding volume The Stars are Also Fire. Set in the solar system centuries after the departure of colonists to Alpha Centauri, its plot concerns earthman Jesse Nichols, a poet and dreamer by inclination, invited to join a Lunarian conspiracy to seize an antimatter shipment from Earth’s dreaded machine overlords. They aim to bring it to the distant planetoid Proserpina where humans have escaped the control of the AIs. Venator, the villain of the preceding volume, appears again, this time as a downloaded personality. This third book of the series is quite different from the others in that it is essentially a novella, readable in one sitting. When Tor published it in hardback, they tried to compensate for the meagre length by including a series of illustrations by Vincent Di Fate, who did the cover art for this series and has been an acclaimed science-fiction artist since the 1960s. Di Fate’s drawings are mainly generic scenes of spacecraft, with only a handful actually reflecting the action in Anderson’s book. Not only is Harvest the Fire just a novella, but it also doesn’t affect the overall plot of this series. A reader could easily skip from books 2 to 4, and Tor seemed to think the same because this book was less promoted than the other volumes.While I enjoyed the series as a teenager, when I was too ill-informed about the world to pick up on Anderson’s political advocacy, on later re-readings I found the first two volumes in the series fatally flawed by the overt libertarian agitprop. Harvest the Fire is superior to the earlier volumes in that it lacks those highly unrealistic dialogues that serve more to castigate “big government” than depict realistic characters. Sure, Anderson works in a dig at income tax and the book continues the series’ theme that the rise of AI might quench human ambitions, but the political concerns are no longer so heavy handed.That said, the characters continue to be fairly one-dimensional, and the writing is so simple that I wonder if Anderson was intentionally reaching for a young adult audience. Furthermore, the plot feels repetitive in that our protagonist is again an earthman caught in a big conspiracy out of love for a mysterious, elf-like Lunarian beauty. I'd give this a grand-spanking "meh." This has the signal flaw of being the third book in a series but not noting that fact anywhere on the cover - I only realized this when I went to write a review. This does explain why some of the interactions between the characters have an unvoiced tension - this could perchance be the history and backstory which was built up over the past two novels... But I don't believe I'll be finding out: it isn't quite interesting enough as a story to really get me to read more, and the woodenness of the Lunarians is particularly off-putting. For a better example of how to treat a similar plot arc, take a look at Niven, Pournelle & Flynn's Fallen Angels. Third book in the series was quite simple and linear, but little bit to bitter for my taste. Nothing special unfortunately. An enjoyable tale of space travel and civilizations, struggle for resources, and machine intelligence. Not a great sci fi novel, but a good read. If you liked "Harvest of Stars" and/or "The Stars Are Also Fire", you'll probably like this. Standard space libertarian ubermensch novel.